The midfielder will captain the Scotland Under-21 side in their Euro qualifier against Ukraine. John McGinn believes recent form has vindicated his summer move to Hibernian, adding that manager Alan Stubbs is getting the best out of him. The midfielder made the move to Easter Road in August after leaving St Mirren at the end of last season, following much speculation about his future. McGinn has since thrived in Edinburgh and credits Stubbs with his improvement over the fast few weeks and months. “I waited a long time [to make a decision about my future],” he explained. “It was important to myself that it was the right move to make. “I spoke to a few managers, but when I spoke to Alan Stubbs I knew right away that I would be given the opportunity to play and the opportunity to play in a style that would suit me. 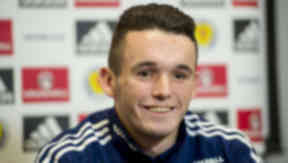 McGinn will captain Scotland’s Under-21 side for their European Championship qualifier against Ukraine on Friday night, and believes he would ready for the step-up to the senior side should the call come. “If I was given the opportunity then I think I would fit in well, but that’s up to Gordon [Strachan] and whoever impresses him tomorrow night,” he said. 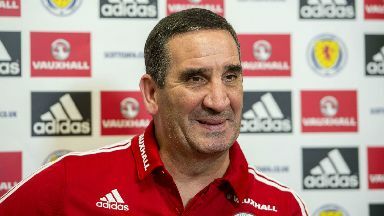 Gordon Strachan’s presence on the sidelines of training this week has sharped Scotland’s Under-21 players, according to Ricky Sbragia. 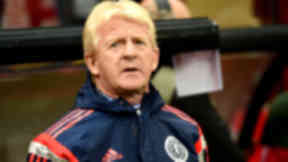 With the senior team without a fixture after missing out on the Euro 2016 play-offs, Strachan has spent the week with Sbragia’s side as they prepare for Friday’s European Championship qualifier against Ukraine. “From day one he has come in and helped us, the staff as well, with his knowledge,” Sbragia said. “He’s come in and watched us, and spent a bit of time with the players, and he’s probably just getting to know the players. “There’s been a bit more tackling going around. There’s been a competitive edge, more so than normal.